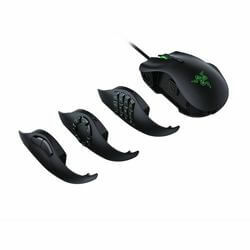 The Razer Naga Hex features 6 large mechanical thumb buttons specially optimized for MOBA and action-RPG user interfaces. Every pro-gamer can map their 6 favored spells, abilities, and items to these buttons for rapid actuation. In action-RPG and MOBA games, intensive clicking is necessary to deliver relentless blows on one’s enemies. So pro-gamers need a mouse that can keep up. The Razer Naga Hex utilizes special switches that lasts up to 10 million clicks. It also accurately registers up to a whopping 250 clicks per minute, perfect for those with lightning fast reflexes.